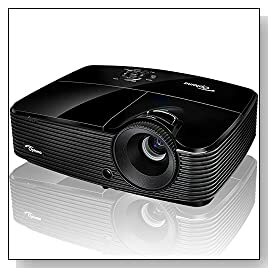 Home theater projector manufacturers are keep on trying to bring out new models with different specifications and price bands. Optoma W313 is another latest entrant from the well know brand at an attractive price. The brand name that has always been associated with high quality projectors. Will this new model uphold the legacy of Optoma‘s built-quality and performance? 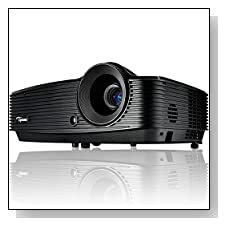 Optoma W313 Full 3D WXGA is one of the nicer looking projector we’ve reviewed recently. Here’s our results to help you decide whether you can buy this premium model or go with a cheaper one. Full 3D WXGA projection with 3200 lumens and 10,000 hours of lamp life. Amazing 20,000:1 contrast ratio which brings excellent movie watching experience. Comes with BrinlliantColor and DLP technologies. VGA, HDMI, S-Video and composite input ports to suit all kinds of devices. We got to play around with the Full 3D WXGA variant as a review unit. This model also comes with a XGA variant at a much lower price. The model employs DynamicBlack, BrinlliantColor and DLP technologies to bring life to the videos and images. The display creates razor sharp images and videos with incredible color details. Thanks to its DLP technology which has a response rate of 16 microseconds, we didn’t find any sort of rainbow effect on projected videos. By virtue of its great true color projection quality, we spend lot more time in watching HD movies than we normally would do with a projector. The Optoma W313 doesn’t take too much of your time to get started. It was very easy and simple to setup and start using the device. We had no problem whatsoever with installing and adjusting the projector to exploit best quality display. The unit comes in a very simple box that includes a full function remote control, batteries, user manual in CD, power cord, VGA cable, good quality carry bag and warranty card. What was more surprising is the remote control works very well even it’s not directed towards the projector. What makes this unit brilliant is its built-quality. The projector should be part of your home theater system till the technology becomes obsolete or you think of throwing it for no reason. As with all Optoma devices, the built-quality and material used for the body does inspires confidence that it will lost for long. Thanks to the hardware under the hood and exclusive technologies, the model suitable for both office presentations as well as personal home theaters. We must point out that we spent more time with this device in watching few HD videos than on presentation slides.